Hello everyone! This is Steven, the CIR in Seika. I’d like to write about an event I attended recently. 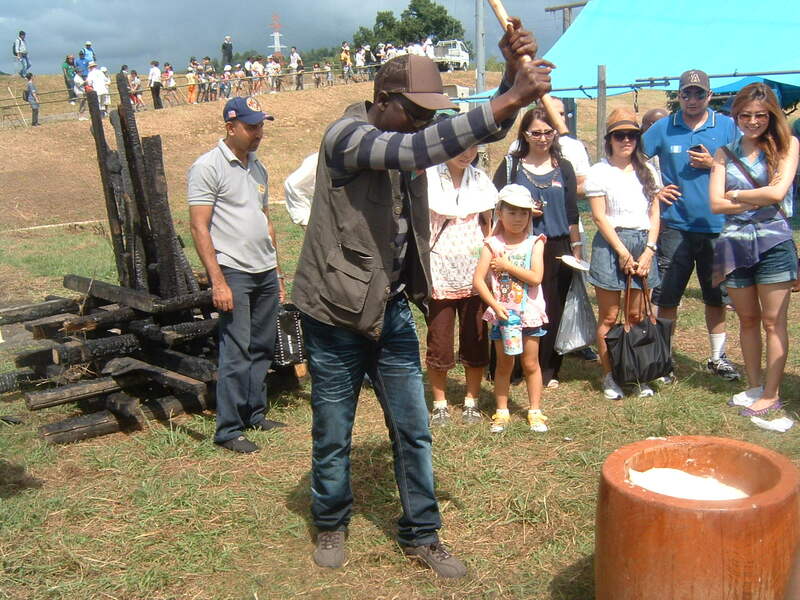 Cross-Cultural Farm Harvest Festival in Fukuchiyama, in rural northern Kyoto Prefecture. 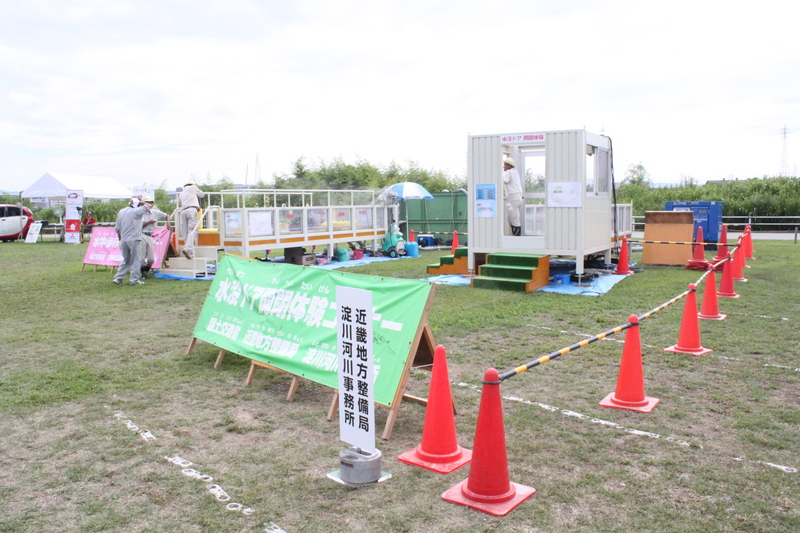 After a two-and-a-half hour bus ride, everyone was glad to finally arrive and jump into the event. 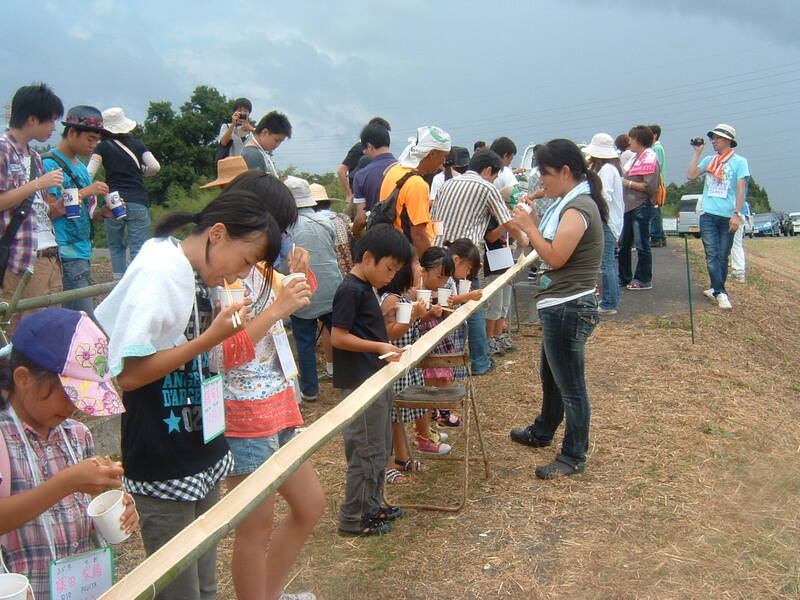 Those who were hungry were particularly in luck, as the event began with mochitsuki (pounding rice cakes) and nagashisomen (eating noodles being flushed down a bamboo tube). 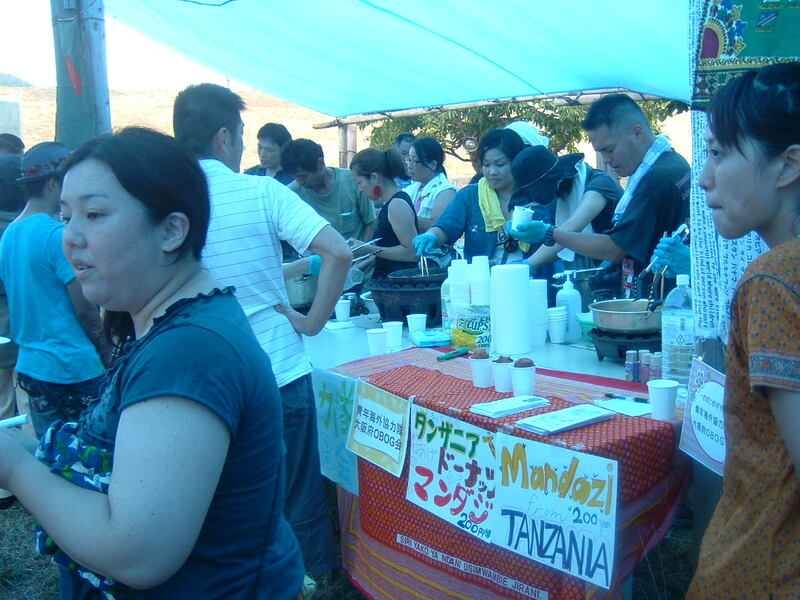 There were also stands selling different foods from around the world, such as Thai curry or Tanzanian mandazi (fried bread). After that, it was time for a game. The children at the event were given hand fans and markers and told to get their fans signed by people from as many different countries as possible. With many different countries from all corners of the world represented, including Kenya, Armenia, Jamaica, Kyrgyzstan, Vanuatu, America, and more, this gave the kids a lot of work to do! After the game, everyone went over to a nearby field where sweet potatoes were growing in the ground. Everyone put on gloves and started digging with their hands or a trowel. Luckily, most people managed to finish digging out the potatoes before a sudden storm came and forced everyone to take cover under the tent. 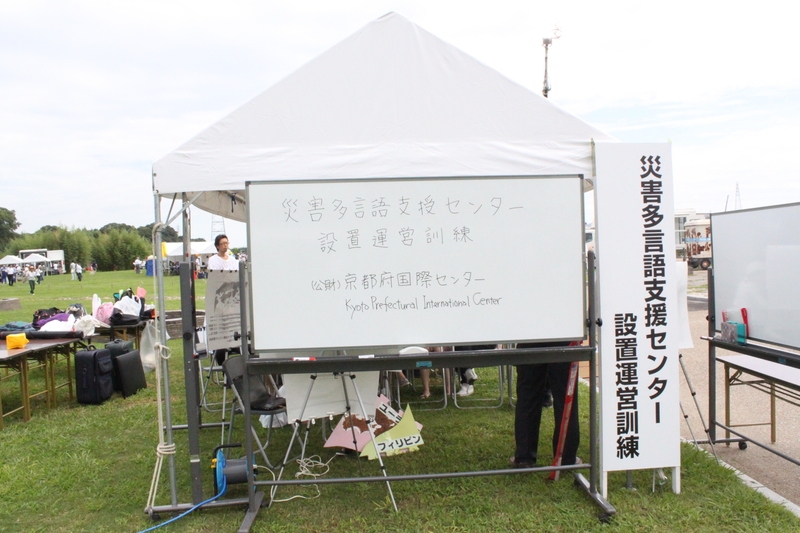 The potatoes were then set aside to be donated to victims of the Great East Japan Earthquake. Eventually, the rain stopped, and people were able to leave the tent again. After a quick break for people to enjoy some delicious yakisoba, it was time for the next part of the event, a dance show. There were two street dancing performances, one group and one solo, followed by a traditional Philippine dance by a group of four women. Then came the final part of the event, a fashion show displaying dozens of traditional outfits from a variety of different countries. 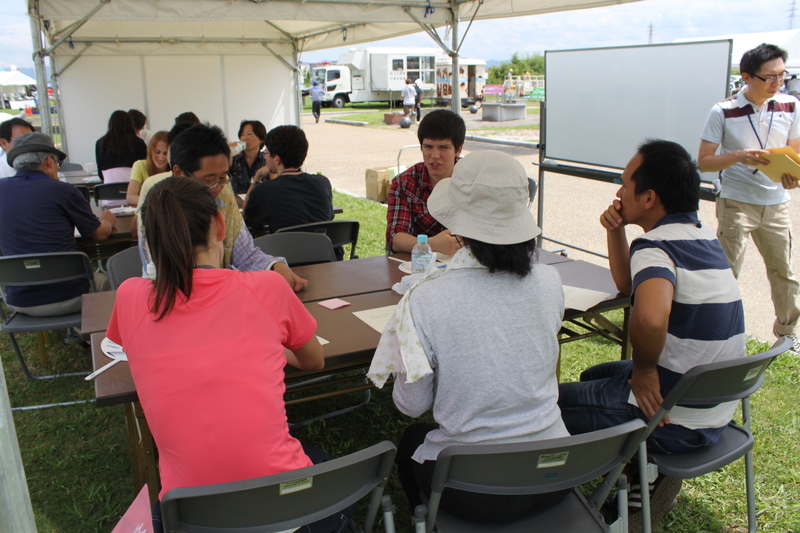 It seemed like everyone had a lot of fun and enjoyed the chance to talk with people from a wide variety of different countries and backgrounds. Here’s looking forward to next year! Hey everyone, Margaret from Kameoka here. I’d like to share my recent summer camp event with you. 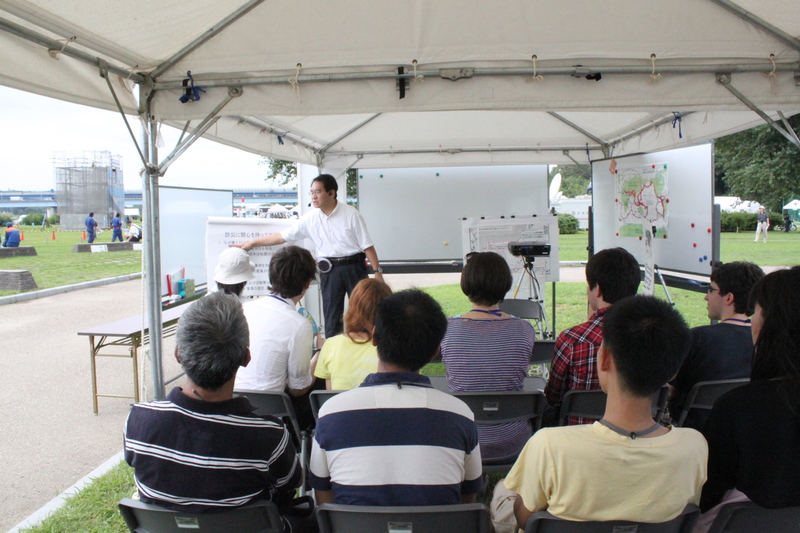 On August 19th, I organized a one day summer camp event for kids in Kameoka. When I was growing up in the United States, I participated in summer camps every year during our 3 month summer vacation, and I was excited to have the chance to share some of my experiences with the kids of my town. I thought it would be best to have a one day camp where I could teach camp crafts, camp songs, and camp games to the kids. I asked 3 of the Kyoto CIRs (Steven, Alice, and Mark), and 3 of Kameoka’s ALT’s (Lars, Judith, and Mason) to help me out. 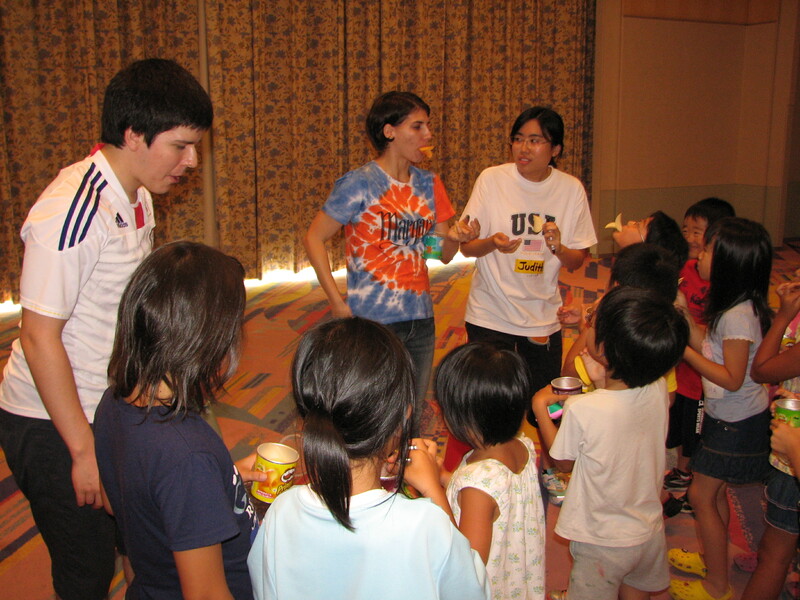 Rather than try to teach English, I wanted the kids to have the chance to learn about games and crafts played by kids in America and to have a chance to interact with people from a different culture. 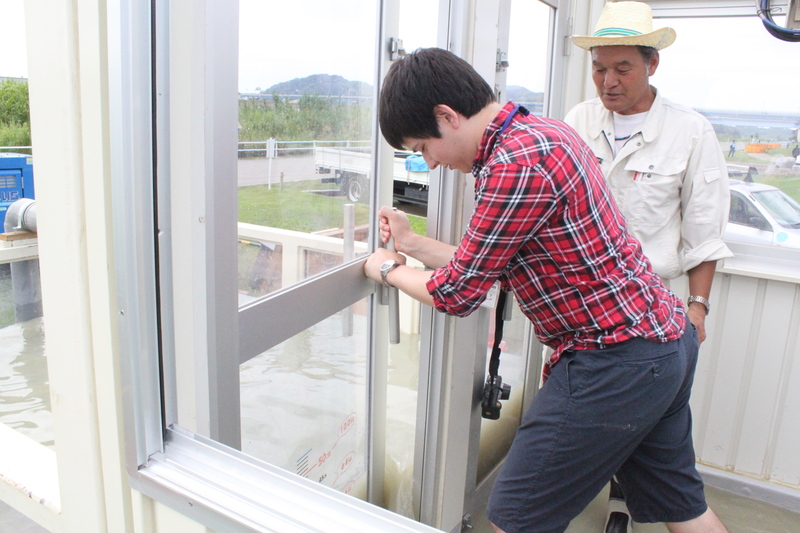 We began with an ice-breaking activity to get the kids loosened up. We stood in a circle and held hands. 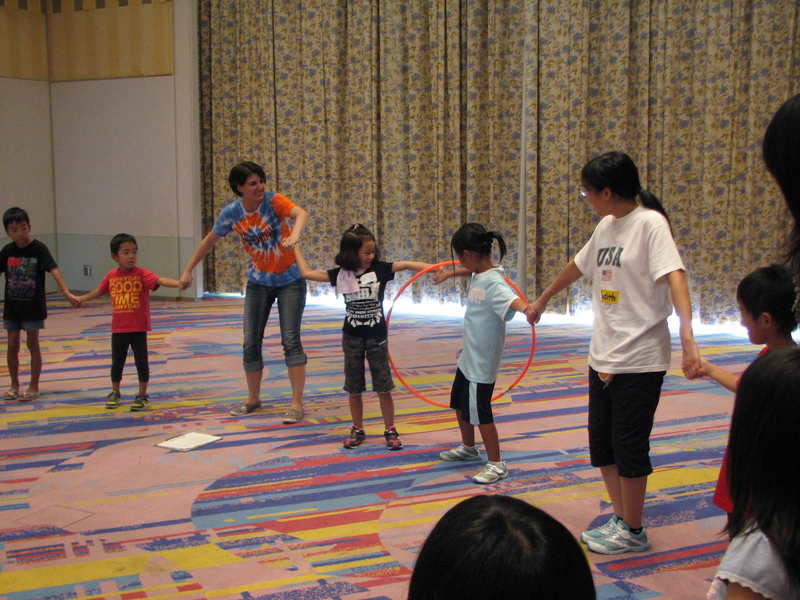 Then we had to pass a hula hoop around the circle without letting go of our neighbors’ hands. The kids all seemed kind of nervous and wouldn’t talk in the beginning, but by the end of the game they were already making friends with the CIRs and ALTs. As we went downstairs to start decorating shirts I could see some of the kids were still holding hands and talking happily to their new friends. We started the activities by decorating t-shirts, which is a very popular camp activity. The kids created their own unique designs using tape and stencils. They used special fabric spray paint to add color and when they removed the stencils and the tape the design was left in white. Each of the kids brought their own creativity to the project and they took a lot of time creating their designs. Another big theme in American camp crafts is the idea of “re-use.” We often use packaging from snacks or drinks to make crafts that we can use in a new way. We used passed out cans of Pringles during the break and the ALTs showed the kids how to make a duck face with their chips. It reminded me of playing with my friends as a child. They used markers, construction paper and origami to design the outside of the can. Then we used see through colored plastic strips to create the kaleidoscope on the lid. The staff jumped right in the middle to help explain the directions. When finished, the kids excitedly watched the changing colors of their kaleidoscopes. We finished up with a special hand-game I learned at camp. It was great to see the kids getting excited and involved with each other, even though only three hours before they had been strangers. That’s the power of camp! Being not from America myself, I had a great time with international exchange at the American Kids camp. We had 2 wonderful cartoonists in the staff, so the kids could “order” any kind of shape they wanted to spray on their T-shirt. Very interesting designs were born this way, such as smiling planes above a sea of rainbow clouds etc. Everyone was painting excitedly and many ended up with very colorful hands and elbows. The kaleidoscopes were really fun as well. The kids were amazed that you can reuse something like Pringles cans in such a funny way, and I must admit I was as well! I helped kids to do their own design, and it was very fun to reflect together about what to put next on the box: a whale? A sea? A yellow bird? Etc… It brought me back to my childhood and was really refreshing. 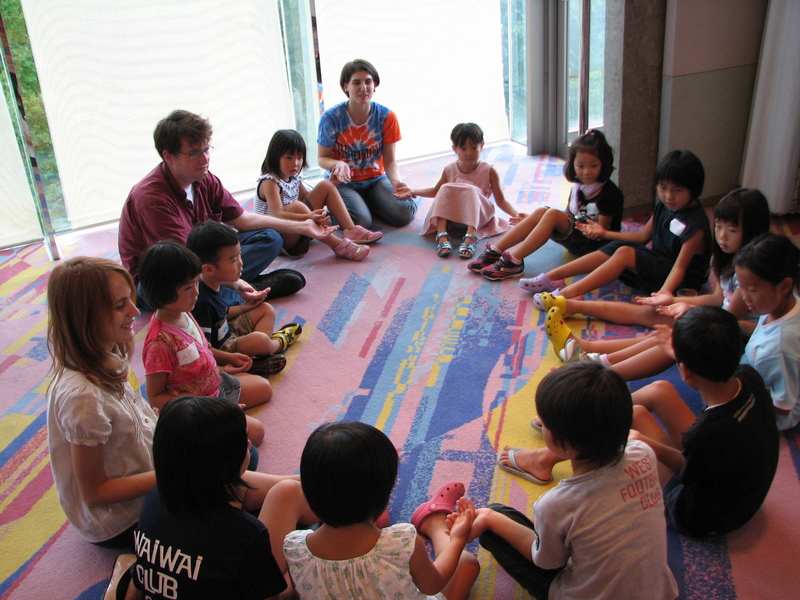 We don’t have many occasions to interact with Japanese kids and this was a very very great opportunity to do so while opening them up to new cultures and way of thinking. I hope I will be able to participate again next year! The summer camp was a great time. The kids seemed to both understand and enjoy the games, even though they were different from what they were used to. It was also fun for me getting to participate in games with kids and help them with their crafts. 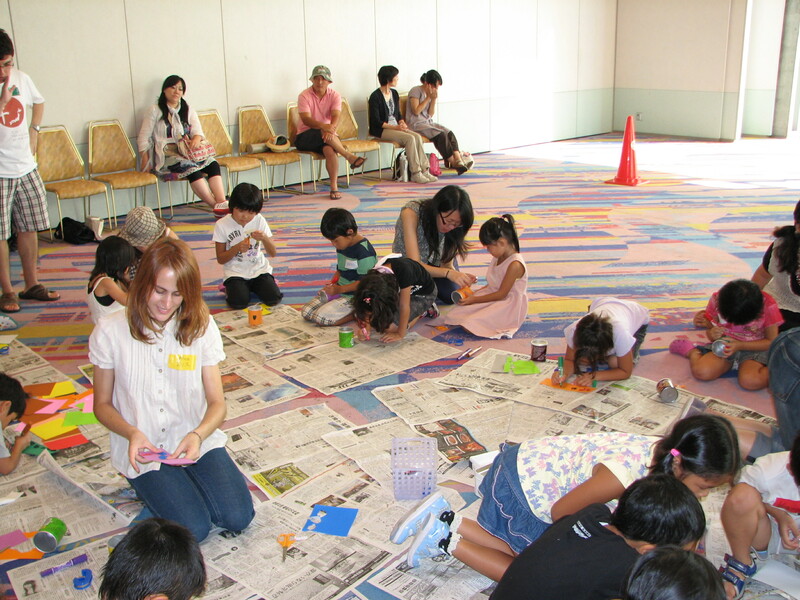 At first I was worried that the kids would be too intimidated to interact with adults, especially non-Japanese adults, but most of the kids were actually very excited to play with us and show us the kaleidoscopes and shirts they made. Even some of the shyer kids were clearly enjoying themselves by the end. Overall, I think everyone had a lot of fun. 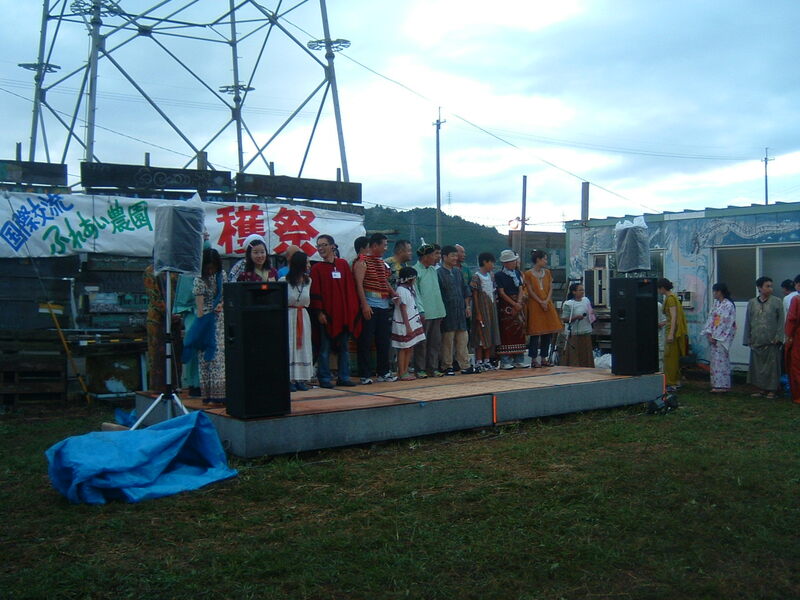 On the 19th August, I took went to Kameoka for the first time to take part in the American Kids Summer Camp event, run by the local Coordinator for International Relations. Not being from the USA myself, I wasn’t entirely sure of what to expect, but the whole point of the event was to introduce a different experience to the local children, so I was very excited to play my part! “Playing” my part really was the order of the day; I didn’t quite estimate just how much energy young children have, and despite ending up exhausted at the end of the day, I thoroughly enjoyed helping the kids make their t-shirts, kaleidoscopes, and playing games with them! This was my first time as a sort of moderator for a children’s event, and I had an absolute blast, and I hope I can contribute to events like this in the future!